Herbal programs may work more effectively when the pH is in balance. Get more from your supplementation program by balancing your pH. Your body is able to assimilate minerals and nutrients properly only when its pH is balanced. It is therefore possible for you to be taking healthy nutrients and yet be unable to absorb or use them. If you are not getting the results you expected from your nutritional or herbal program, look for an acid alkaline imbalance. Even the right herbal program may not work if your body’s pH is out of balance. Note that a food’s acid or alkaline-forming tendency in the body has nothing to do with the actual pH of the food itself. For example, lemons are very acidic, however the end-products they produce after digestion and assimilation are very alkaline so lemons are alkaline-forming in the body. The correct ratio of acid and alkaline forming foods is difficult to know since the balance is altered by chewing, food preparation, individual lifestyle, genetics, exercise, and mental outlook. 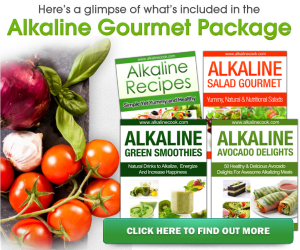 However, those prone to infections, viruses, excess mucus problems and other toxic acidic conditions need to increase their alkaline diet. There is a simple way of measuring saliva pH. First, you must wait at least 2 hours after eating. Fill your mouth with saliva and then swallow it. Repeat this step to help ensure that your saliva is clean. Then the third time, put some of your saliva onto the pH paper. Some health food stores and pharmacies stock pH paper. What you are looking for is narrow range pH paper measuring pH 4.5 to 7.5 or pH 4.5 to 8.5. These pH strips to measure acid/alkaline balance pH belong in every family medicine kit, right beside the thermometer to measure body temperature. pH paper for the test are relatively easy to acquire. Some health food stores and pharmacies stock pH paper. What you are looking for is narrow range pH paper measuring pH 4.5 to 7.5 or pH 4.5 to 8.5. These pH strips to measure acid/alkaline balance belong in every family medicine kit, right beside the thermometer to measure body temperature.